Walking around Crete offers a chance to learn about the past, with history on display in every corner. It seems incredible that something as quiet and beautiful as this church was, centuries ago, a site of conflict. Catholics, Orthodox Christians and Muslims in turn made it a place of worship and demonstration of power; it not only had to survive religious disputes, but also numerous earthquakes and fires that left it in tatters. But it was rebuilt again and again, its architecture ever changing. 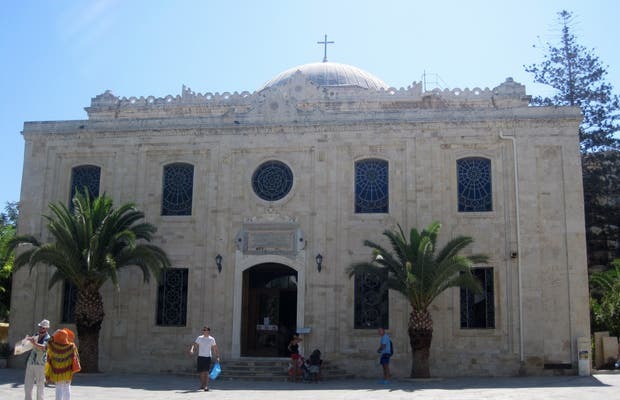 After many battles, in 1925 it finally fell into the hands of the Church of Crete, thus returning to the Orthodox Church.